L.A. Puppy Love is managed by pet care specialist, Andy Kam. 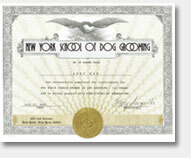 He obtained his certification from the prestigious New York School of Dog Grooming in 2004 and later relocated to Los Angeles to learn various styles of grooming. Working for two well known salons in Hollywood, he quickly mastered the art of styling while understanding the client’s need for perfection. In 2006, he trained a group of Japanese grooming students on “The Art of Creative Styling” at the Pasadena Convention Center. Later that year, he volunteered with Best Friends Animal Society by grooming newly adopted pets in downtown Los Angeles. Andy acknowledges holistic grooming is the best way for your dogs to feel comfortable and healthy. During his tenure years, he developed various stress-free techniques on handling dogs safely and with care. He believes routine treatments and natural grooming products will help your pet live a healthier, happier life. 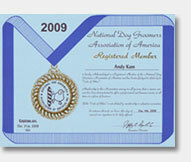 Andy is also a proud member of The National Dog Groomers Association of America. He is committed to growing professionally, consistently attending seminars to further his expertise on best practices and products. 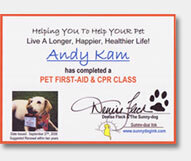 He recently completed a series of training on Pet First Aid & CPR. With his experience, knowledge, and gentle approach, Andy has become a true pet care specialist. Rest assured that your pet will feel safe, comfortable, and loved under his care.